Many pets are susceptible to congestive heart failure and other heart conditions. But with the right treatment, your pet may be able to perform more high impact activities and live a more active life. Benazepril Hydrochloride is an ACE Inhibitor used to treat heart and vascular disease in dogs. Benazepril works as an inhibitor to the overproduction of the hormone angiotensin, which causes blood vessels to constrict. The drug also dilates and relaxes blood vessels, enabling easier blood flow through vessels. Benzaepril works as an inhibitor of the hormone angiotensin I, which in the conversion to angiotensin II, causes blood vessels to constrict, high blood pressure, and decreased blood flow to organs. 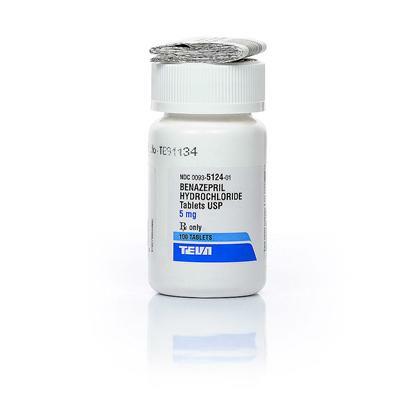 Benazepril Hydrochloride slows down the increased formation of these hormones, and also works to relax blood vessels. The result is an enhancement of flow through blood vessels. Benzeapril is the Generic Alternative to Lotensin. This drug is not recommended for pets with severe liver disease, lupus, blood abnormalities, a history of cardiac output failure, or pets with low sodium levels. Use with caution in pregnant or nursing pets, and if your pet has had an allergic reaction to ACE inhibitors. Common side effects include loss of appetite, vomiting, diarrhea, weakness, collapse, increased thirst, changes in urination, slow heart rate, and weak pulse. Contact your vet if side effects occur. Possible drug interactions include spironolactone, non-steroidal anti-inflammatory agents, diuretics, and vasodilators. The active ingredient of this drug is Benazepril Hydrochloride. Inactive ingredients include colloidal silico dioxide, crospovidone, hydrogenated castor oil, hypromellose, iron oxides, lactose, microcrystalline cellulose, and polysorbate 80. Benazepril Hydrochloride is a prescription drug, and should be dosed by your veterinarian. Administer once per day or as instructed by your vet. This drug works most effectively on an empty stomach. Consult your veterinarian when stopping use.